There are lots of children on Hill Street, but no little girls Betsy’s age. So when a new family moves into the house across the street, Betsy hopes they will have a little girl she can play with. Sure enough, they do—a little girl named Tacy. And from the moment they meet at Betsy’s fifth birthday party, Betsy and Tacy becoms such good friends that everyone starts to think of them as one person—Betsy-Tacy. Delightful, fun and incredibly charming! My daughter is new to reading so we are always looking for books to read together so when Book Club Girl mentioned Betsy-Tacy I was like “Who in the world is Betsy Tacy?” Well, Betsy and Tacy are actually two girls who happen to be best friends. Do you remember when you were young and how you used to play until the street lights came on? How you would carve that old refrigerator box into a playhouse because video and computer games didn’t exist? Well, this book is all that and so much more! 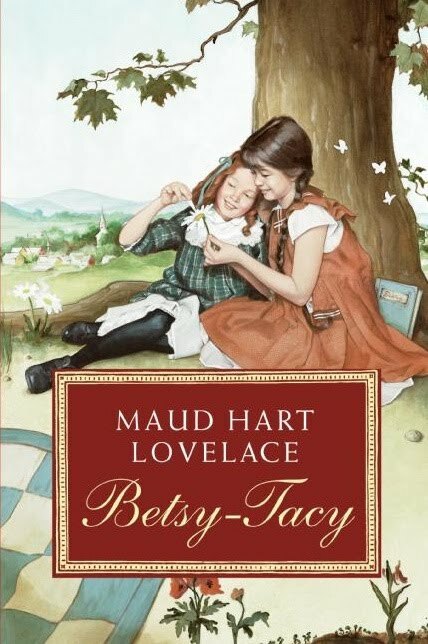 Betsy-Tacy is the first book in the series and is made up of short stories about such things as picnics, paper dolls and the first day of school. There are hills to climb and family dinners to be had. This book is just charming. My daughter said that she is Tacy and that I am Betsy. We sit on the couch and look forward to the adventures that these girls share. Even for me, an older reader, I find that it’s quite easy to slip back into childhood while reading these stories. After a long day a work, who wouldn’t want to slip back into childhood for a little bit of an escape? If you have never read a Betsy-Tacy book, I urge you to check them out. My daughter and I are really enjoying them but I think I am enjoying them a little bit more. Don’t tell! Read more about Betsy-Tacy here. You may also join the Betsy-Tacy Society. Thanks to Book Club Girl and HarperCollins for sending me the series. Great review! I kept wondering why fans are so rabid, and your review helps get to the bottom of it. How cute about you and your daughter! I am so glad that you and your daughter love Betsy-Tacy! And the books in the series just keep getting better, especially as your daughter gets older. Great review! My daughter and I are reading this one together right now. We both are loving it! It's cute and funny at the same time. Thanks for the review! I loved this series when I was a kid, and read all of the books in it more than once. But since my only child is a boy, I didn't get to pass them on and share them with the next generation – lucky you, AND your daughter :-). Enjoy! I adored Betsy-Tacy and Betsy-Tacy-Tib when I was young! I read the whole series up to Betsy's wedding, I think! So glad to see people are still discovering it! It seems like not so long ago that I was reading it, to be honest! One of my favorites! I don't know how I missed these books! I just read the first two books and loved them. My daughter read them a few months ago and has been nagging me to read them ever since! They are just precious! The cover is adorable; I loved reading with my daughter when she was young. Very special times. I'm so glad I'm not the only person who had never heard of Betsey-Tacy. I've seen these books everywhere lately and now I understand why. This sounds like such a great series. I hope your daughter continues to enjoy reading! I am always a little disappointed when they issue new editions of classic juvenile fiction with new cover illustrations. Do kids only respond to images that look like themselves? When I was a kid I was always the opposite, liking things that looked nothing like me, my place or time. Thomas – That's a good question. When I was a kid, I gravitated towards what was different as well. Personally, I think this particular cover looks a little like the American Girl covers and those books (and dolls) are quite popular right now. I hadn't heard of this series but will make a note, little Brooklyn will reading before I know it and as grandma bookbabie it's my responsibility to make sure she becomes a reader! This series was probably my second favorite next to the Little House books. I just adored these read them over and over. I am hopeful that my girl will want to read them herself soon. I had never heard of these books as a kid, and am absolutely loving them, especially the high school books. This one, the first, reminded me so much of adventures my best friend and I had when we were young(er). I'm currently in the middle of reading the series (and love it for much the same reasons!) because Library Hospital is hosting a Maud Hart Lovelace Challenge. You should link this post up when the time comes!